Today he and his friend Jason Sacks found 2013's Blackfish, directed by Gabriela Cowperthwaite. Jason Sacks: Daniel, the best documentaries are the ones that show aspects of our world to us in ways that we never knew existed. They reveal deeper truths and provide more interesting insights than we may have received without those films. That's why I love watching documentaries with you, and why I'm glad that we're resurrecting this Convenient Truths column. We've waited too long to bring it back, and I'm glad that you and I are doing a "Marvel Team-Up" on streaming documentaries again. This week's fillet, Blackfish, offers up a whole kettle of fish of complex issues, giving us plenty to chew on, old chum. Excuse my punny ways there, Daniel, because while it's fun to crack jokes about most movies, there's not a lot aboutBlackfish that is fun. 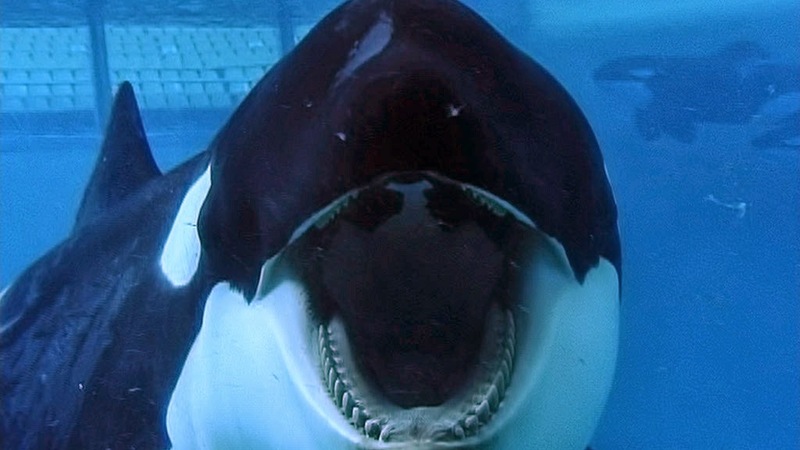 In fact, this film is one of the most eye-opening pieces of propaganda that I've ever watched; part nature show, part true crime story and part parable about man's hubris about our control over the animals, Blackfishtells the terrible story of what happens when places like Sea World capture killer whales and place them into captivity. Let me spoil the movie for you: the results of this captivity are horrifying. This film makes accusations that marine parks commonly engage in animal cruelty in the way that the whales are handled, routinely separating whale cubs from their mothers, separating whales from their pods, and shortening the lifespans of these majestic animals. Anyone who supports an industry that forces whales to perform for the amusement of humans rather than roam free through the world, the film states, is complicit in these crimes against the planet. Daniel, I'm not going to assess the claims of this film in this segment of my essay, but the film certainly brings up a number of important points that are worth discussing. Is it acceptable to force wild animals to perform for our amusement? What would be the humane way – if there even is a humane way – to manage these far-roaming, extremely family-oriented creatures in captivity? Are we complicit in allowing a business to continue that, as one person states, may be seen in 50 years as being incredibly cruel? And as men who review and think about entertainment in great detail, there are deeper issues to consider as well: what kind of price do we exact on our world in order to have a fun day at a place where whales can splash us? Is this like a bullfight and an inhumane relic from a less enlightened time or is it a wonderful advertisement for good stewardship of the oceans? Finally, there's the final question to consider as we assess whether this film succeeded or failed: does it make its case effectively or is it too one-sided, too over-the-top to be considered as anything other than propaganda? I have to admit I teared up watching the whales frolic off Vancouver Island in the concluding few minutes of Blackfish, but was I manipulated into that feeling or did the film earn it? Did I leave enough questions for you, my friend? Daniel Elkin: Yea, Sacks, you did and I thank you for it. I, too, liked this documentary, but I think I liked it more for the thinking it inspired in me than for its film-craft. This is a documentary that clearly has an agenda and these types of films tend to make me bristle. In my eyes, I think the film-makers did themselves and their film little service by becoming so ham-fisted at the end. 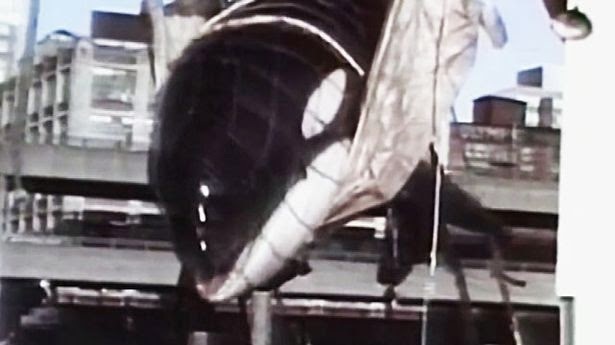 Still, in its quest to sway hearts and minds, however manipulative its artistry may be, Blackfish unavoidably brings up questions like those you have already asked above. Before addressing each of your questions, though, I would like to thrown in another observation I had while watchingBlackfish. As you know, Sacks, I teach High School English and for my Sophomores this year we are examining human cruelty in terms of its inherent motivation, as well as the after effects of cruelty on those who suffer through it. After exploring some of the more philosophical ideas about why we are so cruel to each other, we're now looking directly at the damage done to victims – we've studied PTSD as a result of combat, how social behavior suffers as a result of Genocide, and now, using Toni Morrison's Beloved as our guide, we're looking at issues of slavery and the psychic devastation it sired. Slavery was possible because one group of people felt that another group of people weren't really human and therefore didn't have the same vivid emotional lives. Vermin and cattle aren't capable of love or empathy. The howls of a mother as her baby is ripped from her breast to be sent god only knows where are just the gibbering of a beast, not a real emotional reaction. These animals don't feel like we do, right? When leading scientists in the field are telling us that the emotional life of an Orca may actually be more intensely felt than our own, it's time to drop all the pretenses and see things for what they really are. The trade in these animals for entertainment and profit can be seen as a form of slavery. What are the effects of this form of cruelty on those that live through it? Our country is still paying that debt, the ramifications reverberate still. “Because even though it's all over – over and done with – it's going to always be there waiting for you,” as Sethe says in Beloved. I think this adds another layer to our discussion of the entertainment value of Sea World. If entertainment is predicated on acts of cruelty – and we have a long storied history of this type of fun – then what does that say about us? When we delude ourselves even further and mask the damage we are doing in the name of profits, what have we become? I guess I've ended up adding more questions to the pot instead of trying to answer any of them. Then again, maybe the questions I'm asking are of a rhetorical nature. Sacks: As a privileged upper-middle-class white man (albeit one whose ancestors were Russian peasants and whose distant cousins were killed in the Holocaust) I'm uncomfortable talking about issues of slavery. But I'm not uncomfortable talking about issues around obliviousness, and unintentional cruelty. I know about the process of hypnotizing oneself into believing that you're better than others, thinking that you’re superior to others in some way: more thoughtful or feeling or empathetic or simply abstractly superior to others. That's privilege, after all. Much as I try to be humble, I'm not as empathetic as I’d like to be. Sometimes it takes a bit of a reminder to show me I should be more empathetic, to put myself into the shoes (or fins) of someone else and try to see life through their eyes. It's easy to be blind to the mistakes that we make every day by being oblivious until the consequences of that unawareness are shown to us, until we are forced by one means or another to see things from a different perspective. I had simply never considered the captivity of whales as a problem – at least not in anything other than the same abstract sense I have that it's weird for us to hold tigers or peacocks in zoos either. Blackfish shines a light on the issue of whales being held in captivity and it does indeed sound terrible, horrific, a terrible crime committed against these majestic animals. And there's absolutely no doubt that some of the incidents described in this movie, particularly the incidents that happened with the whales in Victoria, are terrible in nearly every way and not to be condoned. There's also absolutely no doubt that Sea World and other venues have treated some whales incredibly poorly and triggered incidents where these creatures end up killing people. But in the one-sided presentation of this propagandistic movie, we're not given any counterpoints to consider. For instance, we're shown that Sea World has bred several generations of whales in captivity – in fact, that is used to imply callous disregard for human life – but we're not told anything about those whales. Are they more violent than other whales because of their bloodlines or less violent because they have lived their whole lives in captivity? We're not given that information; if we were, it may or may not have changed my opinion on the matter but it would have given me a more well-rounded way of thinking about the questions that these filmmakers raise. Ultimately, I guess, that's why this film unfortunately fails for me – and unfortunately, ultimately, that's why Sea World wins this propaganda war for me. 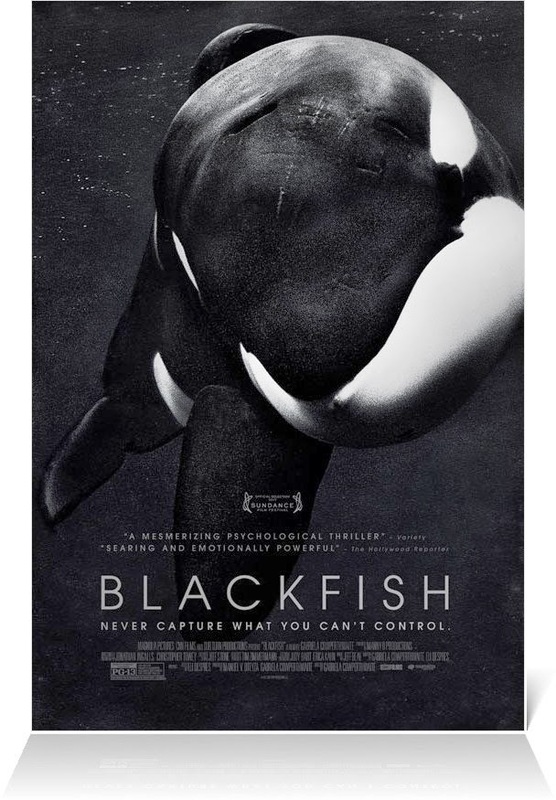 Though tears were in my eyes as I watched the end of this film, the more I consider it the more I feel conflicted about using the world "cruelty" without qualifiers in describing the lives of these majestic creatures that are living in captivity. Am I vacillating too much, Elkin? Am I too interested in making up my own mind to see the truth of what was shown on my TV screen? Elkin: I think you tactfully avoided the larger ethical issues that I had couched in my literary reference, Sacks, and for that I applaud you. I understand that it's all a bit of a sticky wicket, as our reactions to these sorts of things say as much about who we are as about who we want to be. Besides, all political and ethical thought is manipulated and cajoled in some way by these same ego driven forces. I realize my own complicity in this. Questions of cruelty are particularly sensitive matter to me of late. While in no way was I trying to make a direct comparison between human slavery and parading captive animals, if we look at the general argument of Blackfish in this light, then the question of the entertainment value of these Sea Shows takes on more ethical heft. More so, perhaps, than Blackfish is capable of effectively carrying. Like you, Sacks, I found this film to fail as a documentary. It can't decide on whether it is a reportage, a sermon, or a polemic – and its inability to define its tone muddies its narrative as much as its effectiveness. If I remember correctly, this is a CNN produced film, so that probably explains its impotence in settling on an identity. It stumbles through so much innuendo and subjectivity that, by the end of the film, the whole thing becomes so full of finger-wagging that I almost went whale hunting in retribution. This film had some potential, too. If only the director would have narrowed the focus and tightened the narrative,Blackfish could have been a powerful force for change. As is, it just becomes another echo in the liberal sound-tunnel that bleats hollowly into the ears of the already initiated and offers little solution to the ill-defined problem. 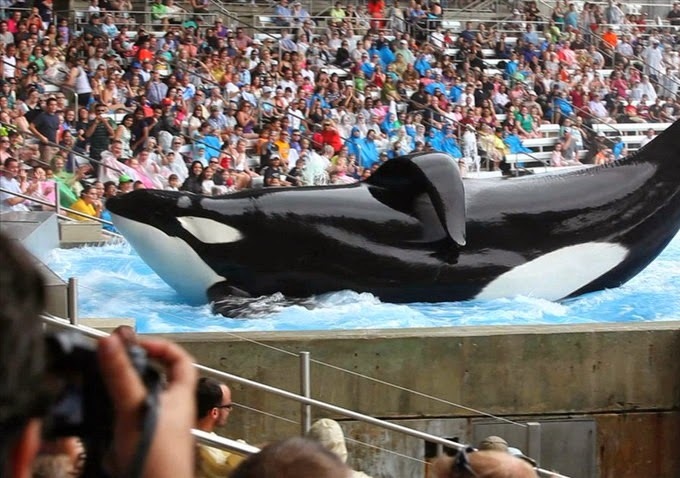 In our more politically correct environment, should people still be paying money to watch performing Orcas? It depends on who you ask, I guess. I have my opinions on this, but I acknowledge that they come from a pretty lazy empathy as well as having spent so many youthful weeks head first in the sound-tunnel hoping to get laid. I wish Blackfish had transcended my own limitations and actually gave me something I could use to intellectual justify my “feelings”. As it is, I'm left with an unutterable dismay and the stress that exists in a sneer inarticulated.